Want to get a fight started? Go to a gathering of gun nuts and shout, nine mil or forty-five? Immediately afterward, get behind cover. When I was entering the gun nut forest for the first time, the writings of Col. Cooper showed me the way. He favored the M1911 in .45 ACP. Even though I have committed heresy at times, I still hold a fondness for single-action self-loaders that pitch a half ounce of lead at the gentle speed of 850 ft/sec. More recently, we keep hearing that the .22 Long Rifle is the round that kills the most people in a given year. Or perhaps it’s the woebegotten .25. So what’s a gun-toting person to choose? If the gun’s too heavy to manipulate or the recoil is so much that I develop a flinch, the thing’s useless to my purpose. There’s no miss that’s good enough, no matter how much noise it makes or how deep a hole it makes in the scenery. Now it’s no good saying that standard calibers are too hard to manage. I’m telling you that I don’t carry a .500 S&W. Dirty Harry’s round is the one on the left. The key here is to find something that you can put on target in a hurry. And I’m not talking ten rounds through one hole. What good does that do? You need to be able to empty a magazine or cylinder into the area covered by a sheet of typing paper or a two liter bottle in short order and at whatever distance you expect to have to defend yourself. Also, the smaller the bullet, the better your aim has to be. do. 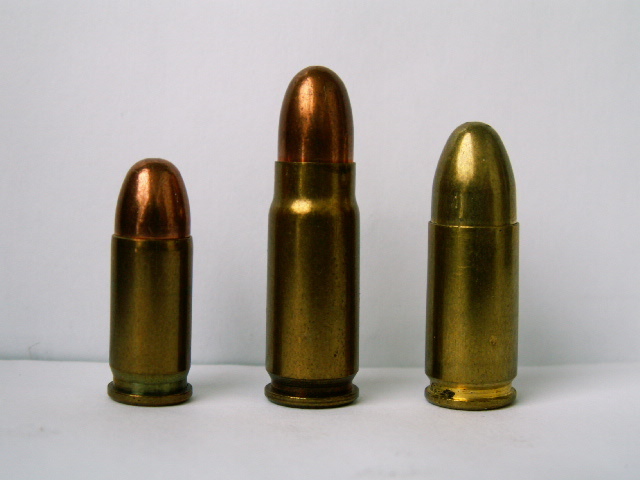 Generally speaking, for small calibers–.22 LR, .25 ACP, .32 ACP, .380 ACP, and 9mm Makarov–the bullets are too light or the powder charge is too low to get enough penetration out of hollow points, presuming they even expand at the typical velocities of those rounds. 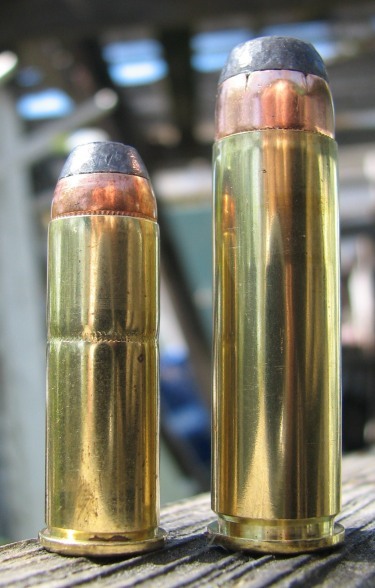 By contrast, .38 Special rounds on up are heavy enough to keep on going, so expanding bullets are better–the bullet does no good once it leaves the bad guy. Whatever your choice of handgun, the round it spits has to get in deep enough to do what needs accomplishing. As I said above, the good ole .22 LR and .25 ACP hit way above their class, but that’s probably because those are common guns. I might rely on a .22, but that’s only because I know what I can do with mine. The safer answer is to go with something that’s going to do a lot of work where it’s going. Yes, an icepick can be used as an effective weapon, but your chances of success with that are far higher if you start the fight first and have trained yourself to drive the shaft exactly where you want it every time. In other words, it’s not all that useful for us good guys who aren’t going about starting animosity. We have to react to someone else’s bad choices in life, rather than picking the time and place to act. Here’s where the 9mm vs. .45 ACP argument really gets thick in the weeds. In days gone by when semiautomatics worked best with hardball, a 9mm wasn’t such a good choice. Just like the icepick, it was small and ran in a hurry straight on through whatever it hit. But we live in interesting times, as the Chinese would say. It’s true that while hollow points don’t always expand, there ain’t no such thing as a shrinking bullet, but expansion is highly likely with today’s ammunition. This means that .38 Special, .357 Sig, .357 Magnum, .40 S&W, 10mm, .44 Special, .44 Magnum, and .45 ACP hollow points are probably going to get big enough to discourage a bad guy. Of course, little bullets also do a lot, but as I said above, the smaller the round, the smaller you’d better be able to aim. I’ve mentioned a number of rounds in this discussion. I’m not endorsing any of them. I carry several of them and have at my disposal several others. I gravitate toward .38 Special, 9mm, and .45 ACP, but that’s just because my guns that shoot those are the easiest to carry. My Colt Pocket Hammerless is elegant, and now and then I grab my Polish copy of the PPK, but those tend to stay locked away these days. The takeaway message here is get something that’s easy to carry and feels good in a common caliber, and you will have nothing to feel ashamed or apologetic about, so long as you’re good with it. The caliber wars are endless, and the only certain conclusion from the data about shootings is that it’s bad to get shot. The only real confidence comes from having close air support and a company of Marines at the ready. Short of that, the handgun you can operate well is likely to be good enough in an emergency. This entry was posted in .22 Long Rifle, .45 ACP cartridge, 1911, 9 x 18 Makarov, 9mm cartridge, Going Armed, Gun culture, Guns, Handgun Design, Kel-Tec P-11, Radom P-64 and tagged .22 Long Rifle, .25 ACP, .32 ACP, .357 Magnum, .357 Sig, .38 Special, .40 S&W, .45 ACP, 10mm, 9mm, 9mm Makarov, colt revolvers, concealed carry, Greg Camp, jeff cooper, M1911, penetration, placement, punch, self defense, Thompson-LaGarde on 2013/06/15 by Greg Camp. Hold on one minute, I hear some saying. Didn’t you already wander outside the pale by accepting a pocket 9mm as a worthy sidearm? Well, yes, but, um, all right. I told you I’m a heretic. Today’s heresy involves a handgun whose caliber, at least, would please Cooper. It’s a Sig Sauer P-250, chambered in .45 ACP. It’s also available in 9mm Luger, .357 Sig, and .40 Short & Weak, but more on that later. If it shoots the sacred round, what’s the problem? It’s double-action only. There are no safeties, just about six long pounds of pressure to squeeze off a round. The trigger breaks right at the end of the line with no overtravel, and it goes all the way back to reset. If you imagine the smoothest double-action revolver, you’ll get the idea. The long reset does make a second shot slower than what a single-action trigger can give, but it’s fine for what I can do. And what’s that? As I’ve said in other articles, I don’t care much for bull’s eye shooting. If pieces of paper take a notion to attacking me, I’ll use scissors. My practice enemy of preference is soda bottles, and those evil containers of death (or so says Mayor Bloomberg, but I drink diet) are in mortal danger if they’re within twenty yards of me while I’m armed. That’s true even with the long double-action of the Sig. Well, when I’m shooting using both hands. One-handed, I’d pull the muzzle off target a lot, but that’s a matter for more practice, not the gun’s fault. The sights are the three-dot variety, and since mine’s relatively new, they still glow in the dark. The recoil is stiffer than my other .45s. That’s because the Sig has an all-polymer frame with a steel slide. The guts are just a light metal rectangle with some springs and other parts. In fact, those guts are the gun. That’s where the serial number is. Take out one set of guts (done by removing a single pin) and insert a different set with the matching magazine and slide, and you have a new pistol in whichever of the four calibers you want. 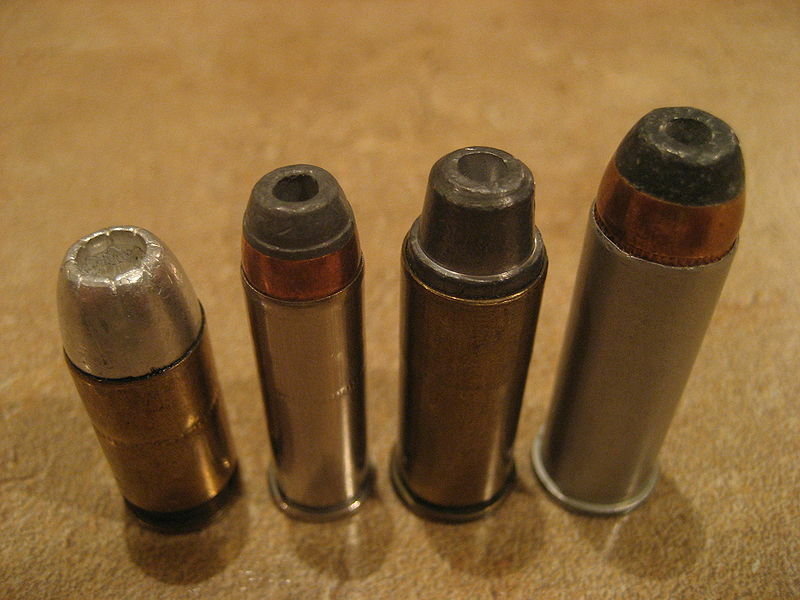 One of these days, I’ll get myself the .357 Sig guts, since I’ve been itching to try that round for a while now. The frame is also easy to change. I may do that sooner. I bought this gun in a pawn shop, so I didn’t have a choice in frames, but after wearing the beast for a litte bit, I realized that the sandpaper texture of the grip wasn’t going to cut it. (Scrape it, yes, but not cut.) I got after it with my own piece of sandpaper and smoothed down the surface, but I’ll leave abrasive grips to those who need them. So what’s my heresy? I’ve been an M1911 man ever since I got into guns. My 1911 was my first self-loading pistol, and that design’s the gold standard for all others. But now, at times, I’m carrying a Sig Sauer DAO P-250 instead. It’s a bit fatter than Browning’s slim model, but it holds the same 8 + 1 rounds and slides nicely into an inside-the-waistband holster. As I told you, heresy is about choice, and I like choice. I still don’t have a Glock, though. This entry was posted in .45 ACP cartridge, 1911, 9mm cartridge, Concealed Carry, Glocks, Going Armed, Guns, Handgun Design and tagged .357 Sig, .45 ACP, 9mm Luger, concealed carry, double action, double action revolver, Glock, John Moses Browning, M1911, night sights, P-250, Sig Sauer, single action, target shooting on 2012/11/23 by Greg Camp. Is That a Gun in Your Pocket, or Oops–It Is! I must confess to breaking the laws of Jeff Cooper. As you know if you’re well-versed in the Colonel’s writings (and you are, aren’t you? ), the standard for judging handguns is the 1911 in .45 ACP. (Look for a celebration of the same on the 29th of this month.) He consistently referred to the 9mm cartridge as a minor caliber and had no use for double-action pistols. As someone who has learned much from what Cooper taught, what am I doing with a double action nine? The weapon featured is the Kel-Tec P-11. Its trigger requires a long and somewhat heavy pull for each shot (double action only), and it spits out a bullet of .36 of an inch in diameter. So I’ve accepted a 9mm pistol as a carry weapon. What about its double-action trigger? The P-11 is a pocket gun with no safety. That being the case, it needs a trigger that is like a double-action revolver–long, weighty, but smooth–and that’s what the P-11 has. It won’t fire when I put it in my pocket. My complaint against Glocks is that they have a light trigger with no safety (Plaxico Burress, anyone?). The Kel-Tec doesn’t have that problem. Despite its weight, I can control the trigger well enough to hit targets in rapid fire within self-defense distances. While dry-firing, I was concerned about the trigger reset–the trigger moves a long way back and has to go all the way forward again–but that wasn’t a problem at the range. I did have one or two cases when my finger didn’t let it reset, but most of the time, the recoil is enough to take care of that. My question with any self-defense handgun is whether I can use it to place multiple hits into a soda bottle at ten yards, and the answer for me is yes with the P-11. So how does it shoot? I put about two hundred rounds through it–hollowpoints, hardball rounds, American-made quality, and cheap Russian steelcased cartridges–and nothing made it stop. The manufacturer recommends against using +P ammunition too often (higher pressure cartridges), so I haven’t those yet, but my P-11 wasn’t picky about regular rounds. I could hit bottles rapidly, and even scored on a clay bird that Sharie, the love of my life, tossed across my field of fire for me. (I missed two other clays, so I need to practice more.) The sights are good, especially for a pocket gun, three white dots that are easy to pick up. The recoil was interesting, and I say that as someone who shoots a Ruger Super Blackhawk .44 Magnum with one hand for fun. The P-11 kicks hard. It weighs under a pound unloaded, and even with eleven rounds on board, it’s about as light as a cellphone. After emptying a magazine, my left hand was sore for a bit. The temperature was in the thirties, but I’ve shot many times in that kind of weather without a similar feeling. The closest that any other gun has come to this is my Radom P-64, about which I’ve written in the past (see the Categories column to the right). The P-64 is a good weapon to compare to the P-11. The Kel-Tec holds eleven rounds of 9mm Parabellum, while the Polish gun has only seven rounds of 9mm Makarov. The P-11 is much lighter, but nearly the same size–slightly shorter (front to back), slightly fatter. The American gun’s trigger weight is 8.5 pounds as opposed to the P-64’s factory twenty-seven pounds (seventeen, now that I put a new spring in it), and its better sights make aiming much easier. It’s also cheap, under $300, tax included. The one advantage that the P-64 has is a loaded chamber indicator. It’s hard to do a brass check with the P-11, and I like being able to see that there’s a round ready to fire. Now I have to restrain myself, or I may run out an buy a PF-9. . . This entry was posted in .45 ACP cartridge, 1911, 9mm cartridge, Concealed Carry, Glocks, Going Armed, Gun Rights, Handgun Design, Kel-Tec P-11 on 2011/03/07 by Greg Camp.